One of the big challenges in astronomy is determining cosmic distances. There are lots of ways we can do this, including things like Type Ia supernovae, brightness changing stars called Cepheid variables, parallax, etc. Each method has advantages and disadvantages, and each has certain inherent uncertainties. To minimize these uncertainties, we try to find objects we can measure in multiple ways. By comparing different methods, we gain a better understanding of the bias of each method so that we can account for them. In this way, we can build a “cosmic distance ladder” using different methods at different scales. So even though we can only use supernovae to determine the distance of galaxies billions of light years away, we know our measurements are accurate because our cosmic ladder gives us confidence in its accuracy. Of course we always want to make our scale more accurate. For this task, finding an accurate measurement of the distance to the Large Magellanic Cloud (LMC) is always useful. The LMC is a satellite galaxy of our Milky Way. It is about 163,000 light years away, which is distant enough to test large-scale methods like supernovae, but close enough that we can use more accurate small-scale methods. The LMC is crucial to making our cosmic distance ladder more accurate. Earlier this year, a new measurement of LMC distance was published in Nature (doi:10.1038/nature11878). 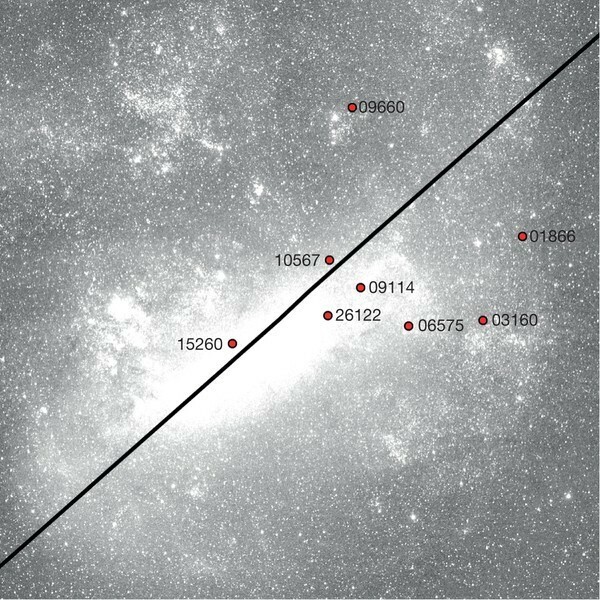 The team obtained this measurement by observing eclipsing binary stars in the LMC itself. The eclipsing binary method basically works by taking two measurements of a binary system. The first is to measure the Doppler shift of the light from each star. Since light from a star is shifted to the red or blue as the star moves away from us or toward us, measuring the Doppler shift tells us how fast the stars are moving relative to each other. The second measurement is to observe the brightness of the binary system. Since the system is an eclipsing binary, there are times when one star passes in front of the other. When this happens the system dims a bit since one star is (at least partially) blocking the other. By measuring these dips in brightness you can compare the brightness of the two stars. These two measurements allow us to determine the mass of each star, from which we can gauge the absolute magnitude (real brightness) of the stars. By comparing them with their apparent magnitude (apparent brightness) we can determine their distance, since the more distant and object, the light bright it appears. This method has been used before, but only with young bright stars, typically with short orbital periods. The downside of young stars is that their brightness can vary a bit. Also, if the stars are relatively close, the gravitational forces between them can affect their brightness. So there has always been an uncertainty of about 5%-10% in this method. What this team did was to go through data from another project that has been observing the LMC for about 16 years. The original project was looking for gravitational lenses, but the data is available for others to use. So this team went through 16 years of observational data and found eight eclipsing binaries that were both cool, older stars, and that had long periods (on the order of 100s of days). You can see these eight binaries indicated on the image below. Using these binaries the team was able to measure the LMC distance to within 3% accuracy. Their result is a distance of 162,980 light years. While a more accurate distance measurement is always good, this work also demonstrates the power of sharing data. The original gravitational lensing project had nothing to do with eclipsing binaries. By making the data freely available, others were able use it in new ways. It’s this type of collaboration and openness that can make science truly powerful.